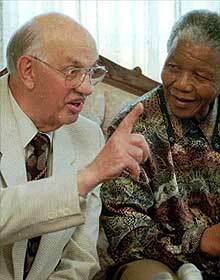 PW Botha was a lifetime politician in the National Party. PW Botha's wife, Barbara, will inherit R5 000 and a BMW from his estate. Barbara will have to leave their home 12 months after his death, and will lose the police protection she has been accorded as the wife of a former state president. Botha left the the house to his 5 children from his marriage to his first wife (Elize). PW Botha left R25 000, shares and book royalties, and the contents of his library to each of his sons; R5 000 to the Bible community of South Africa; and his farm Soli Deo Gloria to his youngest son. The rest of his estate was shared equally between his five children. (Source: Rapport). "God is the only one who decides. I hope his soul rests in peace." "I think we shouldn't be dismissive of anybody. I always reckon that each one of us has the capacity to become a saint, anyone and everyone. I'm willing to acknowledge whatever initiatives he may have taken. But I think that he will be remembered mostly for his ... he was granite-like, you know. And the finger-wagging. Those are the things people are going to remember him for." Thabo Mbeki, Mbeki's wife Zanela, Frank Chikane (whom the apartheid regime once tried to poison), Constand Viljoen (former head of the apartheid defence force) and FW de Klerk attend PW Botha's funeral in the Western Cape. 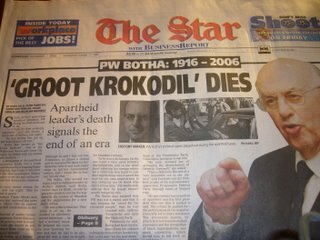 Botha's coffin was adorned with white roses and lilies. In accordance with Botha’s last wishes, Psalm 23 was read and his daughter Rozanne Visagie sang the hymn “Walk with God”. A private burial followed the funeral. A hoax email starting doing the rounds advertising a supposed extremely racist speech was made by PW Botha (reported as a hoax by the Sunday Times). "Circumstances forced him to be a reformer. He was extremely authoritative, militant and not very well read; he relied heavily on the people around him. He started the process of dialogue with the ANC, but this was behind the scenes and very hush-hush." 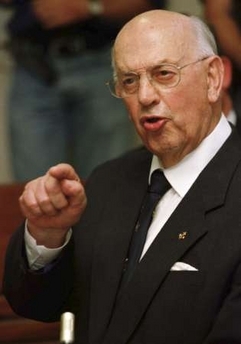 Frederick Van Zyl Slabbert, leader of the opposition Progressive Federal Party Mail & Guardian (1 November 2006). PW (Pieter Willem) Botha dies (aged 90) of natural causes around 8pm at his home lagoon-side home "Die Anker", near Wildernes in the Western Cape, dying while walking arm-in-arm with his wife, Barbara. He leaves behind his second wife Barbara, his daughters Elanza Maritz and Rozannee and his son Pieter. 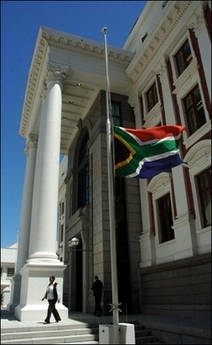 In a statement, the ANC wished Botha's family "strength and comfort at this difficult time". 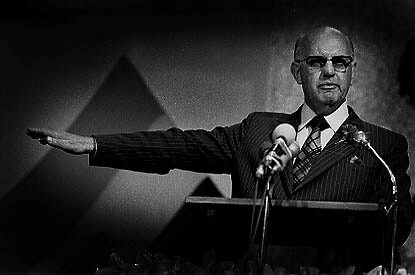 Although PW Botha's security forces killed over 2,000 people and about 25,000 people were detained without trial and often tortured, he refused to apologise for apartheid and denied he had known about the torture and assassinations (and declined to appear when summoned by the state-appointed Truth and Reconciliation Commission which in its final report in 2003 blamed him for much of the horror of the last decade of white rule). PW Botha declares a state of emergency in South Africa. "I believe we are today crossing the Rubicon, Mr Chairman. In South Africa there can be no turning back. I have a manifesto for the future of our country and we must engage in positive action in the months and years that lie ahead." 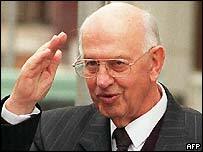 PW Botha is appointed prime minister. "Most blacks are happy, except those who have had other ideas pushed into their ears." PW Botha as quoted in Dictionary of South African Quotations, Jennifer Crwys-Williams, Penguin Books 1994, p53. PW Botha is appointed Minister of Defence. PW Botha is elected leader of the NP in the Cape Province. PW Botha is appointed Minister of Public Works. PW Botha is appointed Minister of Community Development and Coloured Affairs. PW Botha is appointed deputy minister of internal affairs, by HF Verwoerd. 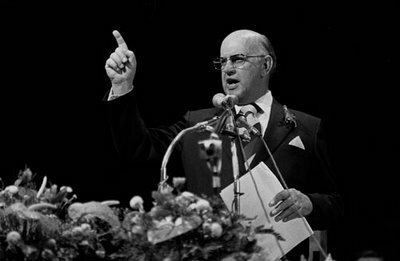 PW Botha is elected to parliament for the first time as a members of the Herenigde Nasionale Party (by winning the parliamentary seat for George). PW marries his first wife, Anne Elizabeth Rossouw. PW begins reading law at Grey University College (now University of the Free State), Bloemfontein. At university he helps organize the Gesuiwerde Nationale Party (Purified National Party) during local by-election campaigns (he was notorious for wielding a bicycle chain as he led raids on meetings of rival parties) and, eventually, becomes the party's campus branch chairman. After an address to DF Malan during a visit to the university campus, Malan offers PW the post of party organizer in the Western Cape. PW drops his studies and moves to Cape Town to take up the post. He sold books for Nasionale Pers (later to become Naspers) who paid his salary. Pieter Willem Botha is born on Telegraaf Farm, Paul Rous District, in the Orange Free State province of South Africa; he is the only son of Hendrina and Pieter Willem Botha (who already had 9 children between them from previous marriages).